Psst. Come here. I found something. I spent a few hours working on the stairwell that leads from the second floor into our attic space, the area we are slowly converting into an open play space for the kids. I was cleaning out the old insulation. A curious combination of foam insulation, blown in wool insulation and what I think is old horse hair and whatever other materials have been used for the past 250 years to try to keep a wood fire heated home warm. Now that we have spray foam insulation on the attic roof and walls, the old insulation in the attic flooring and stairwell to the attic is no longer needed. I started with one side, where now moist (yes, ew!) cardboard had been tacked to the underside of two enormous hand hewn beams and then used as a holder for some pretty terrifying loose insulation placed between the two beams. Clearly, many generations of mice (let's say mice, yes, though I wonder... No, definitely mice) had decided that this was almost as cozy a place to raise families as our silverware drawers. I removed the cardboard, the insulation materials and all its, debris, and vacuumed and disinfected the whole thing. I found this shoe horn in there. And a buffalo nickel, from 1923. Pretty cool. Don't look at my hands in these pictures. It has been a long cold winter. And I had to wash my hands many, many times during this process. Ew. But Elliott points out that my hands look a lot like this picture of Grandma Moses'. I then removed the foam board insulation panels from the wall on that side of the stairwell and found these beautiful wide planks, a feature some of the homes built from the timber on their property in this area have in their attics. Throughout our neighborhood, these boards are hiding in attics and are worked into the paneling in some of the downstairs rooms, often in defiance of the requirement that such huge eastern white pine trees automatically became the property of the King of England to use in the mast trade. I then moved on and removed the insulation from the other side of the stairwell. That's where I found it. 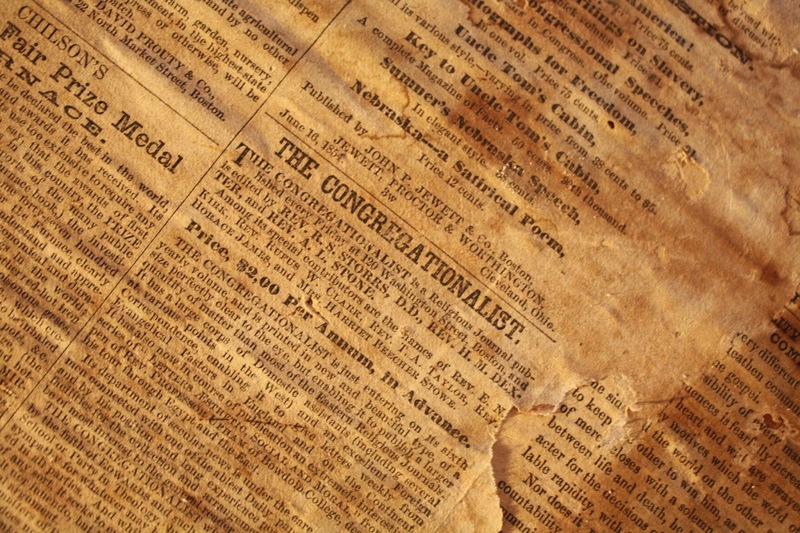 It is the January 20, 1860 edition of The Congregationalist. Read this description of it below. Yes, Harriet Beecher Stowe was a special contributor. Every time I go sit on the stairs with my flashlight from my iPhone on, I find something different on the pages of The Congregationalist pasted on that wall. And I wonder about the story behind how this paper came to be placed there. A demonstration that even in 1860, our country's educators were dealing with changing standards and curriculum. PERMANENT UNIFORMITY cannot be secured where there are issued every few months "different and conflicting" editions of the same book. The use of such a book works the ENDLESS PERPLEXITY of both teachers and pupils. And my personal favorite. Oh my. So excited was I to find this one. Day and evening. Special Advice as to Occupation, &c.
Phrenology, when studying psychology in graduate school, specifically when studying the history of the science of psychology, was considered the beginning of attempts to understand the links between brain and mind. 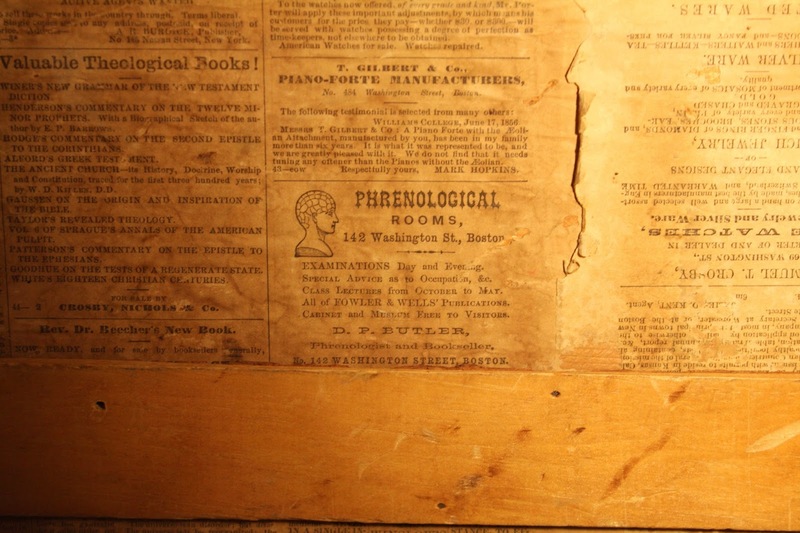 Phrenology was the beginning of neuropsychology, the concept of localization of brain functioning, or that behavior, emotions, all human functioning is controlled by specific regions of the brain. Intricate brain maps were created depicting just where in the brain such virtues as benevolence, secretiveness, sublimity were located. In the late 18th century early phrenologists read the shape of a person's skull, believing the person's possession of such virtues could be estimated by the contours, shape, and bumps of their head. Now debunked, it is the beginning of the story of psychology. And it represents, for me at least, just how much of the craft and art of understanding people is determined by who the individuals in any interaction are. The reader or interpreter hears, feels, and interprets based on their own interests, skills, and proclivities. Oh my. This is very good too. 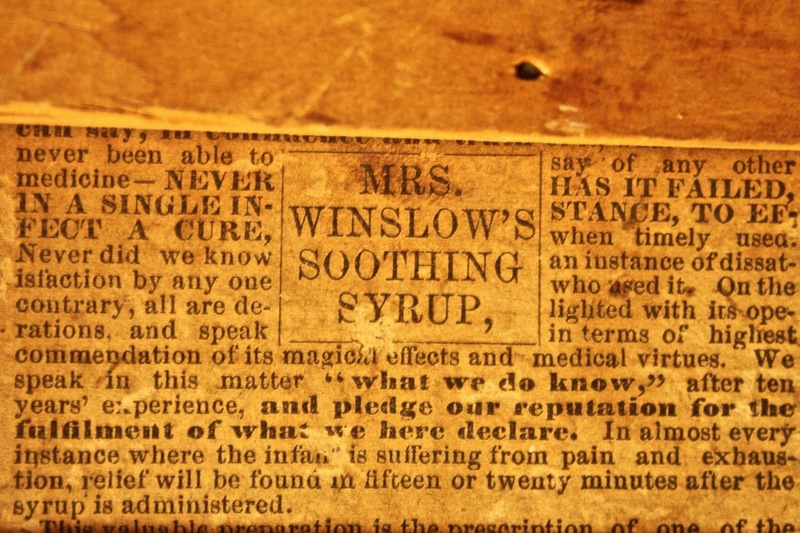 Never has it failed, in a single instance to effect a cure...medical effects and medical virtues...In almost every instance where the infant is suffering from pain and exhaustion, relief will be found in fifteen or twenty minutes after the syrup is administered. I am wondering about the alcohol content in this soothing syrup. Or worse. 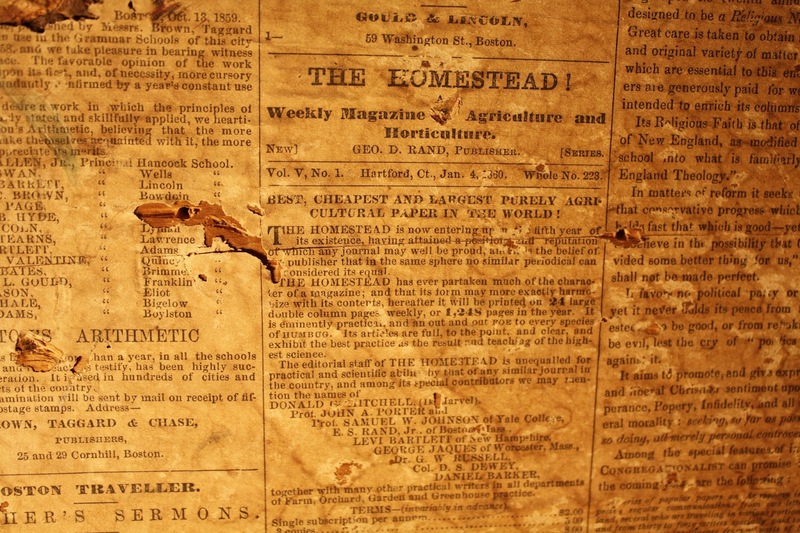 And these homesteading and agricultural advertisements seem so perfect to be on the walls of this home. So that was 1860. When you could have an appointment with a phrenologist then dash down another street and buy a piano. 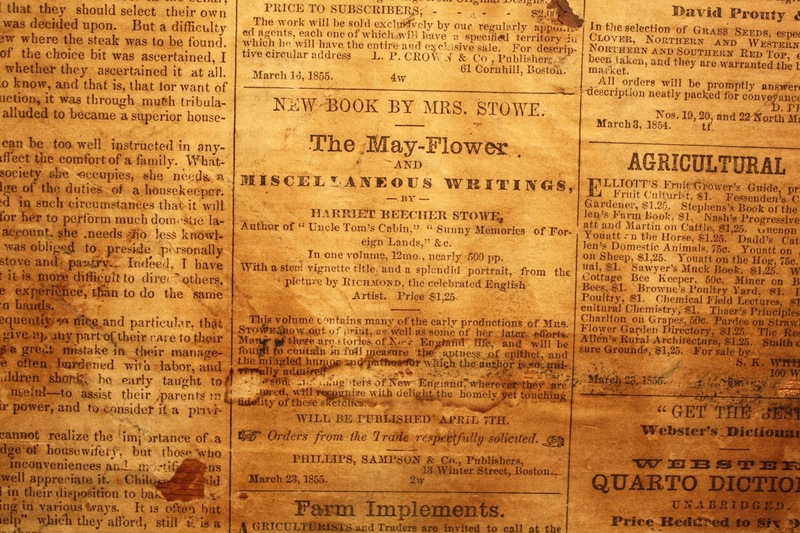 And purchase the latest book from Harriet Beecher Stowe. And you could get advice about homesteading and gardening and cooking. The Civil War was about to begin, young men were about to leave their homes and go fight in its battles, while here, in our front hall, a room was created to hide former slaves as they moved along the Underground Railroad in a small space beneath the stairwell. 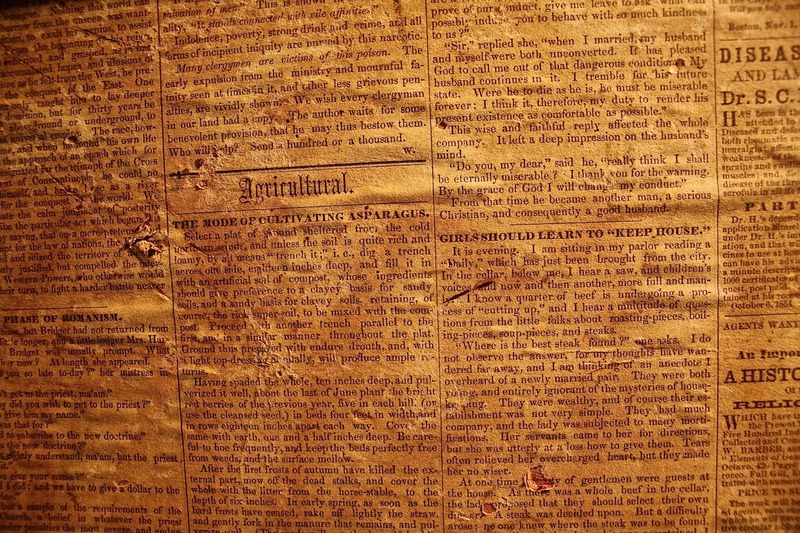 Upstairs, religious newspaper was hung. I find myself reading the walls of this home again, getting to know this home more and more with each project, each a window into its history. I wonder what 2015 will look like to someone who lives here in the future. I wonder what, 155 years from now, we will have lost and left behind here. That someone else will find and try to make meaning of. I found this note on the floor today. Find Owls. 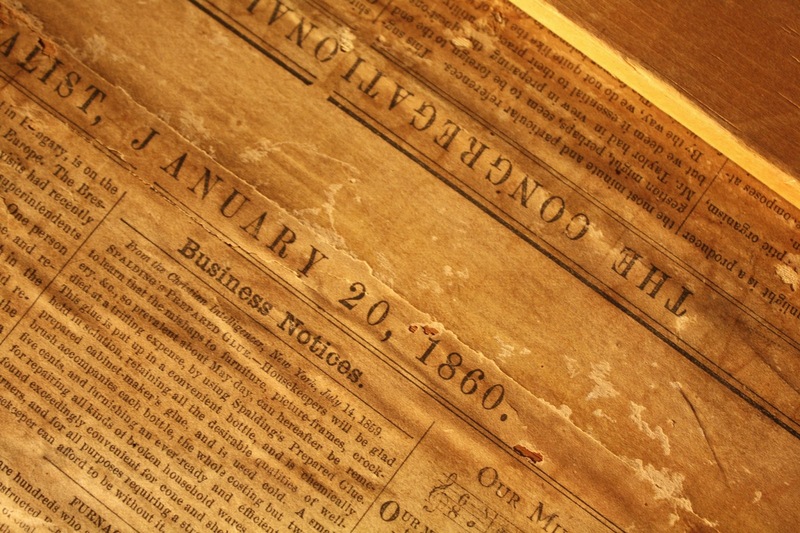 It could easily blow down between two floor boards and be found in 155 years. Will someone be excited and think that there was an ornithologist living here? That this is clear evidence that at one point owls nested in the woods along the Stroudwater River? And that for some reason, on a hot pink post it note, this curiously colored small scrap with an oddly sticky strip along its upper back edge, said ornithologist needed to remind herself of the need to find them? As though I might forget? Or perhaps they would decipher that it was just that that pesky book on owls we had taken out from the library was missing. And the writer needed to spend another morning looking for it while the kids were at school. Both are good stories. And telling of our life lived here; both hold clues to what life here actually is for us. 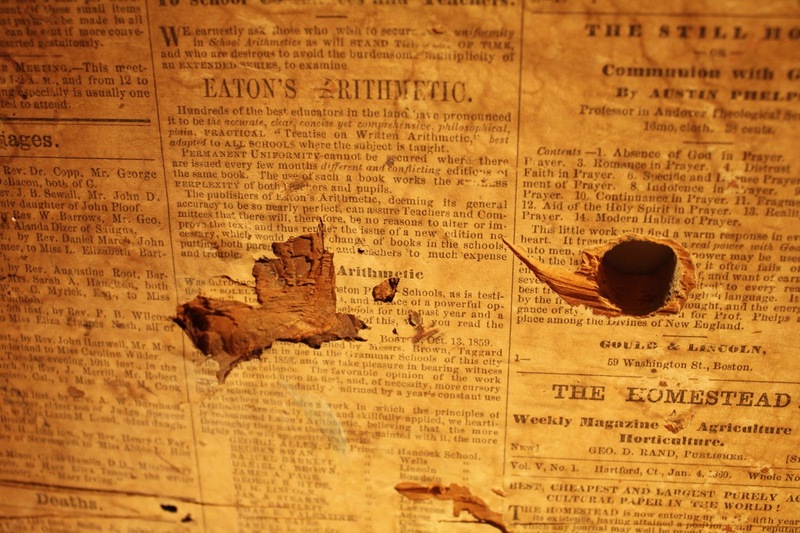 And so, though it probably says more about me, the reader, than it does about the lives here of those before us, I will continue on reading the lumps and bumps and imperfections of the walls of this house.